‘Well begun is half done’ is a great saying that is often related to the use of the most mesmerizing and reviving Sandal wood essential oil for spiritual ceremonies, meditation and other Ayurvedic remedies for treating a wide range of health conditions. Extracted from the woods of the Santalum Album Linn trees that are 30 to 60 years old by steam distillation method, Sandal wood oil is celebrated as the priceless treasure of the Indian Subcontinent. Popularly known as Chandana in Sanskrit, this oil has been used for thousands of years in Ayurvedic medicine for attaining enlightenment, awakening selfless love and for treating an array of physical and emotional health problems. Nobel Laureate Rabindranath Tagore said “if to prove that love would conquer hate, the sandalwood perfumes the very axe that lays it low”. In my perspective, I’ve never seen such a fascinating history as that of Sandal wood. 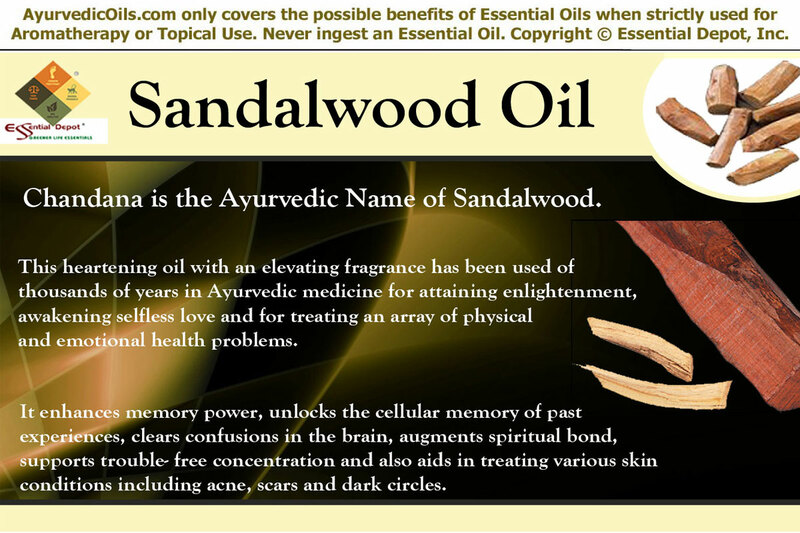 Indigenous to the Southern parts of India, Sandal wood is often a ‘Signature’ of the primordial Indian culture and is the traditional leader in the production of Sandal wood oil for pharmaceuticals and perfumery. The oil of Sandal wood was used in ritual bathing of Gods of the Hindu religion. The Brahma Vaivarta Purana, one of the ancient mythological manuscripts mentions that the most powerful Goddess Lakshmi alleged to reside in the Sandal wood tree. Vamana Purana suggests the use of Sandal Wood for worshiping Lord Shiva, one among the 3 major Gods of the Hinduism. It is also used for decorating new born babies, brides and bridegrooms along with flowers and other aromatic substances. Sandal wood oil is highly respected by numerous ethnicities of the world including Buddhism, Islam, Hinduism and Christianity. This oil is a vital ingredient in the manufacturing of attar since the medieval times. The primeval Egyptians used Sandal wood oil for embalming the deceased, for treating skin disorders and in spiritual flaming for honoring the Gods. Certain Hindu communities place a piece of Sandal wood in the funeral pyre. Saints and priests of India use Sandal wood in homam and yagna yagam for glorifying and inviting Gods for getting their immaculate blessings. Even today, Sandal wood paste is applied on the forehead as a symbol of religious belief and for augmenting the concentration power when applied on the forehead. The heartwood of this tree is considered as a symbol of sacredness in the Vedic texts. It is named after Indra, the Lord of the paradise as Indra’s Sandal wood tress and is said to adore the entire paradise with its compelling aroma. 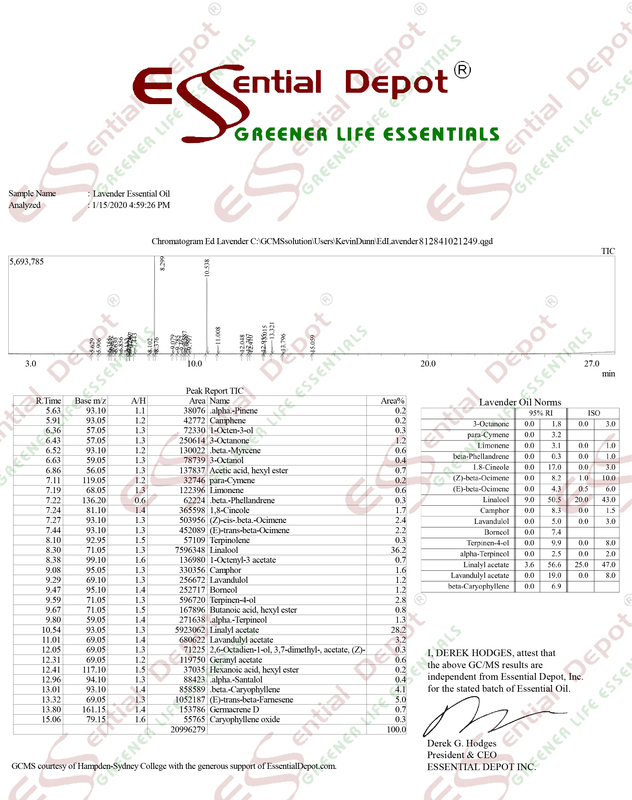 The major constituents of Sandal wood oil are Santyl acetate, Santalol and Santalenes. The remedial properties of this oil are anti-inflammatory, antiseptic, antispasmodic, astringent, anti-phlogistic, regenerating, cicatrisant, expectorant, sedative, emollient, hypotensive, tonic, diuretic, carminative, disinfectant and aphrodisiac. Sandal wood is undoubtedly one of the strongest smelling plants in the world. It is a dignified natural medicine and the best among the sanctified herbs in the Ayurvedic world. 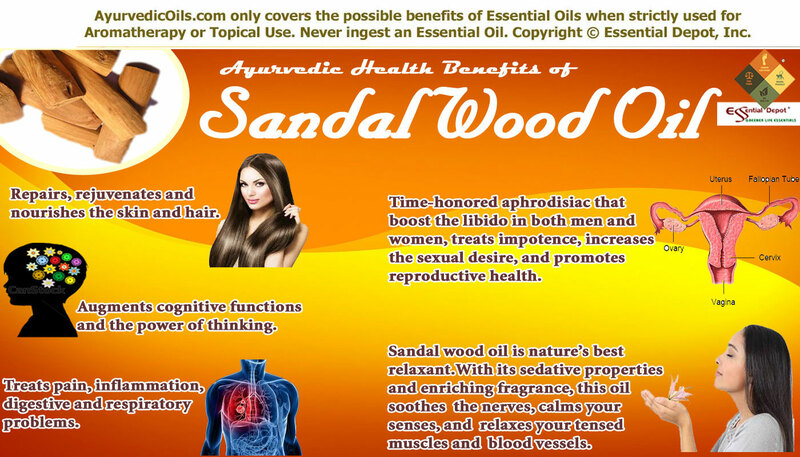 Apart from the spiritual uses, Sandal wood oil is used as a distinguished remedy for numerous illnesses. Among the 3 energy elements (doshas) of the human body, Sandal wood and its oil treats vata (air) aggravation and is said to pacify and balance the fire energy pitta and the water energy kapha. With its exceptional and uniform tenacity, exceptionally soft, magnificent, uplifting and sweet-woody aroma, Sandal wood oil has the potential to benefit the reproductive system, nervous system, marrows, plasma, muscular system and circulatory system. Sandal wood oil is an extremely skin-friendly oil that helps in treating vata based skin problems like flaking, dryness, wrinkling, cracking, roughness and coldness. Pitta imbalances cause acne, oily skin, black heads, blemishes, sensitivity and skin irritations. Using Sandal wood oil in your skin care cream or lotion aids in repairing the damaged cells, eliminating the toxin deposits in the skin, moisturizes and soothes the skin, enriches the skin cells, enhances the skin texture, keeps your skin fresh and helps you get a fair complexion. The astringent, antiseptic, antimicrobial, anti-aging, cicatrisant and disinfectant properties of Sandal wood oil protect the skin from harmful bacteria, virus and other fungal infestations. A recent study have proved that the presence of α-santalol and β-santalol in Sandal wood oil fights effectively against Staphylococcus aureus bacteria and another gram negative bacteria Helicobacter pylori while it also exhibited anti-influenza effect against virus activity. When applied on the skin as an antiseptic, this oil aids in healing wounds, cuts, sores, scars, inflamed skin, pimples and burns very quickly while preventing it from turning septic. Sandal wood powder and oil along with the ‘Golden herb’ Turmeric is a traditional beauty secret of the Queens of the Indian kingdom and is now followed to enhance the beauty of the Brides before their marriage. Apart from benefitting the skin, Sandal wood oil is extremely good for treating hair problems. In their book ‘Ayurveda and Aromatherapy’ Bryan Miller and Light Miller have wrote that Sandal wood oil is effective in treating split ends and dandruff due to vata imbalance. They also suggest a natural blend of medicated oils for massaging your hair for treating dandruff. This blend includes adding 10 drops of Sandal wood oil, 10 drops of lavender oil, 10 drops of cypress oil and 10 drops of yarrow oil with 4 ounce of Sesame oil. Sandalwood essential oil has a cooling effect on the brain and a calming effect on the mind. The sedative properties of this oil guard the nervous system and alleviate the off-putting effects of stress and other negative feelings. For this invigorating reaction, Sandal wood essential oil is celebrated as a perfect meditation tool for more than thousands of years. When used in the form of incense sticks, in diffusers, burners or vaporizers this oil stimulates sensuality, grants a sense of awareness, invokes tranquility, awakens the divine thoughts within and promotes profound relaxation. Inhaling the energizing aroma of this oil enhances memory power, unlocks the cellular memory of past experiences, clears confusions in the brain, augments spiritual bond and supports trouble-free concentration. Applying 1 drop of Sandal wood essential oil on the third eye (in between your eyebrows) is said to boost intelligence and lessen depressive feelings. This point is also known as the point of concentration. Being a natural diuretic, Sandal wood essential oil pacifies the urinary system and helps discharge the toxins and infections in the body through urine. Used in vapor therapy, this oil is also known to treat respiratory problems like bronchitis, chest infections, cough, cold and asthma. A 1999 study by the College of Pharmacy, Brookings proved that Sandalwood oil has the potential to prevent skin tumour development and is an effective chemo-preventive agent against chemically induced skin cancer. Sandal wood paste and oil are a time-honored aphrodisiac that boost the libido in both men and women, treats impotence, increases the sexual desire, and promotes reproductive health. Sandal wood essential oil is extensively used in yoga therapy for crafting sexual energy in nature. Using perfumes with Sandal wood oil, adding 1 or 2 drops of this oil to your bath tub before bedtime, spreading the magic of love in your bedroom by adding 2 drops of Sandal wood oil to your diffuser or massaging your partner with 1 to 2 drops of this oil blended with soothing carrier oils like jojoba oil will bring in a natural feeling of togetherness. Sandal wood oil is nature’s best relaxant. With its sedative properties and enriching fragrance, this oil soothes the nerves, calms your senses, and relaxes your tensed muscles and blood vessels. The encouraging aroma of this oil keeps away from anxiety, fear and restlessness. 2 drops of this oil added to your diffuser can act as a daily dose of relief for treating tension headache, tiredness, stress and for influencing positive feelings. A 2006 study on ‘East Indian Sandal wood and alpha-santalol odor increase physiological and self-rated arousal in humans’ states that Sandal wood is an important medicine in Ayurvedic treatment for treating both mental and somatic problems. This research also proved that Sandal wood oil raised skin conductance level, pulse rate and systolic blood pressure. The regenerating odor of Sandal wood was proved to augment physiological and self-rated arousal in human beings. The cooling and energizing attributes of this oil aids in quick relief at the time of panic attacks, bladder infections, irritability and nervous tension. It upholds tranquility and brings absolute harmony between the mind and the body. These health benefits can be attained either by diluting 2 to 3 drops of this oil in the bath or by using it as a blend with carrier oils in massaging. For all these compelling medicinal values, Sandal wood oil is used in various treatments of Ayurvedic healing like Abhyanga or Ayurvedic massage, meditation, aromatherapy, marma therapy and in numerous other medicinal practices. Sandal wood is the beauty secret of Queens and ladies of the imperial families and is now a part of high quality perfumes, soaps, beauty creams, skin care products, incense sticks and many other products. Pure Sandal wood oil is highly concentrated and is not recommended to be applied directly on the skin. 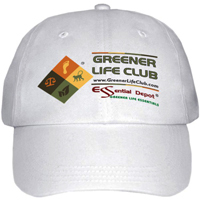 Always dilute it in mild carrier oils before using it for topical application. This article is only for the purpose of information and is not meant to replace any prescription medicines or professional advice of your healthcare professional. Sandalwood: history, uses, present status and the future by Geeta Joshi, Arun Kumar A.N. and Mohan Ram H.Y.